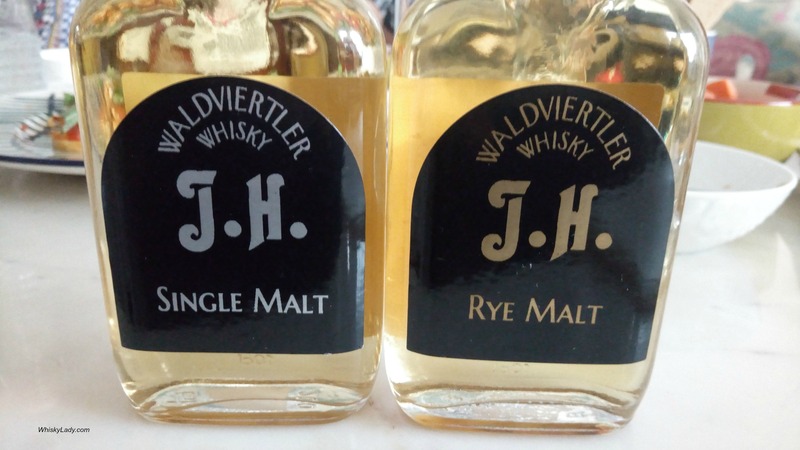 Next up from Austria was a duo from Waldviertler J.H. with their 5 year Single Malt and 6 year Rye Malt. To say it didn’t hit the spot was an understatement. To be fair, this group of Whisky Ladies have little familiarity with rye. At best the Canadian know if from youthful follies of Rye and Ginger(ale). And this Austrian Rye was decidedly young… something we would describe in hindi as ‘kaccha’ meaning it is raw or uncooked… for something that really should be prepared properly. Yet like many of these experiments, it was interesting to try… just wouldn’t go out of our way to repeat. Single Malt J.H. and Dark Single Malt J.H. are made from 100% barley malt. When the malt is roasted lightly, caramel tones emerge, while dark roasting produces coffee-caramel tones. What can we say without sounding discourteous… this was simply not a single malt for us. Far too raw, like hooch that touched wood. Rye Malt J.H. is made from 100% malted rye, light roasted(41%. alc.). Flavor: This rye malt whisky is unique in Euroe, its mellow sweet honey note evolving from the special malting of the rye, hamonising perfectly with the light vanilla flavor of the sessile oak (local oak). 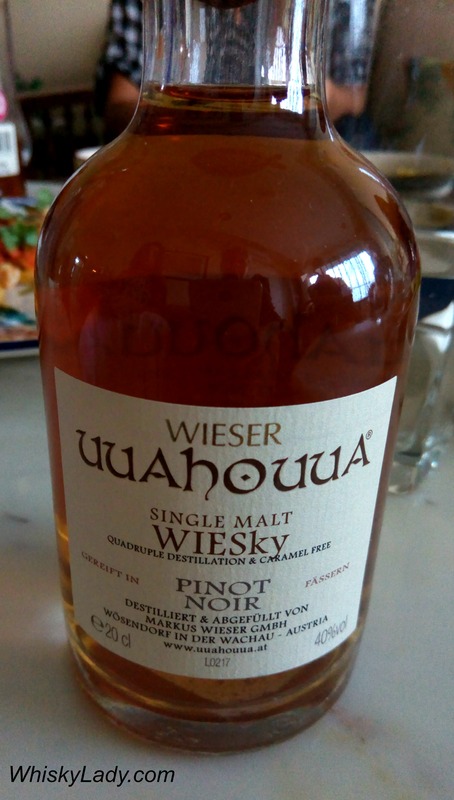 Like Wiser’s Uuahouua Pinot Noir, you can purchase the Rye Malt from the Austrian Supermarket for approximately €62 for the 700 ml bottle. What all did we enjoy in our Après-ski evening? One of the fabulous things about our Whisky Ladies is their adventurous spirit and itchy feet… which means any given month a few can’t make it as they are off traversing the world. For our group – this is a huge plus as it means bringing back little gems which otherwise could never be obtained. Even while back-packing with minimal luggage, one of our ladies scored in Austria a few very interesting miniatures which were duly shared at our “winter” session… paying homage to European ski destinations. Now this whisky might just be worth seeing where they go next. Like many European wine cask finishes, there is something unique. 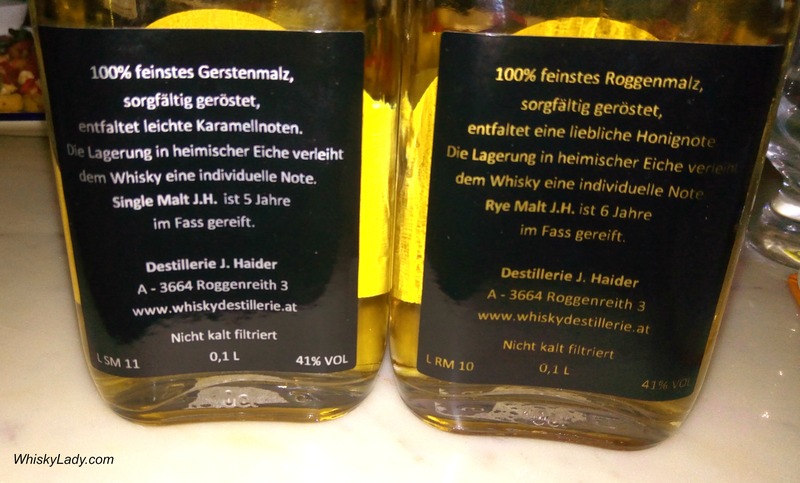 While I have no idea what the 200 ml bottle set our Whisky Lady back, it seems you can purchase a full 700 ml bottle from a supermarket in Austria – how civilized! It currently costs approximately €54 for the 7 year version. What else did our backpacking marvel bring back from Austria? With December, one often thinks of winter, skiing, coming in stomping off the snow, peeling off toque, scarf, mittens and many layers, settling down in front of a roaring fire to enjoy a drink, food, great company… all the while making merry. Our Whisky Ladies decided to embrace a decidedly northern theme of “Après–ski” with European whiskies where one can also enjoy winter sports, even though it remains a balmy 27’c in Mumbai. We began our evening with mulled wine made by our Swedish host and lebkuchen smuggled in from a recent trip to Germany… then quickly shifted gears to a rather remarkable line-up with a few whiskies anchoring the session with full pours and a couple of small shared samples picked up by a Whisky Lady while backpacking around Austria! As for the others, just click on the links and read what we thought!